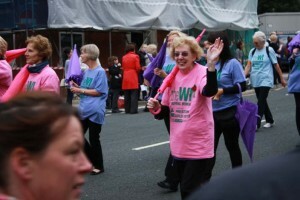 It’s our WI strapline – Inspiring Women, and that’s just what we try to do. At Aspull & Haigh we believe that we can achieve more if we experience more. By having a go at new things, learning new skills and crafts (and polishing the old ones) we all improve and sometimes surprise ourselves with what we really can do. In a group, it’s easy, because there’s always someone to help or support you and you soon learn to laugh when things don’t go quite as they should. Our monthly speakers cover a wide range of subjects and a lot of them involve a “hands-on” or “hats on” trial. Click here to see our programme for this year. Inspired by a National Federation competition linked to the ‘Fast Fashion’ campaign, we designed and made a dress from recycled garments that would suit any and every occasion and we are proud to say it achieved 2nd Place in its category at the final held at the College of Fashion in London! 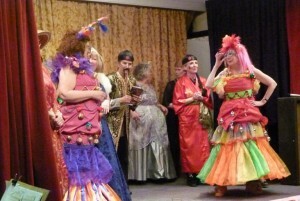 The dress was ‘designed by committee’ as every member was encouraged to contribute their ideas. The dress was made using original garments donated or sourced by members, trying where possible to retain the design elements of the original items for our new dress. 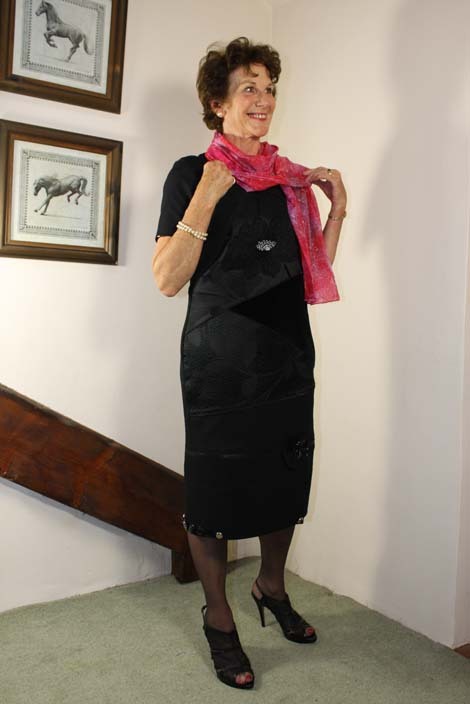 Individual parts of the dress are designed to zip to each other, meaning the dress can be made into different styles by adding or removing the various pieces. 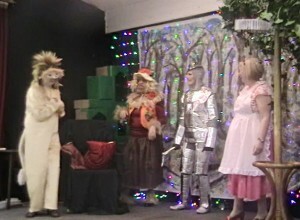 The zips are stitched in a way that they are disguised from view so it looks like a separate complete dress each time. 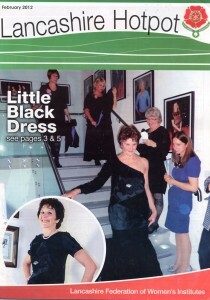 The photos on the left show the office dress and the evening dress but remember, this is the same dress! 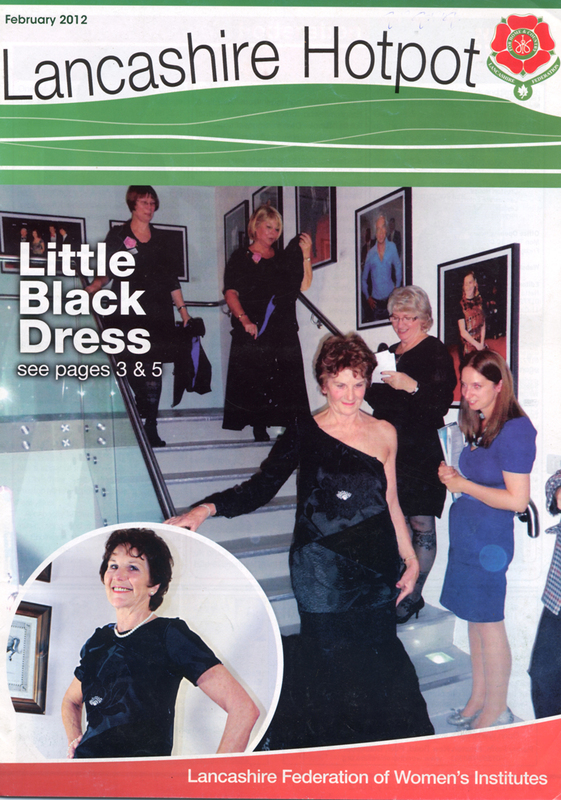 Following our Front Cover appearance on the Lancashire Federation Magazine “Hotpot”, we were invited to display it at the Spring Council Meeting and since then the dress took on a life of its own as we were invited to demonstrate it all over the County. 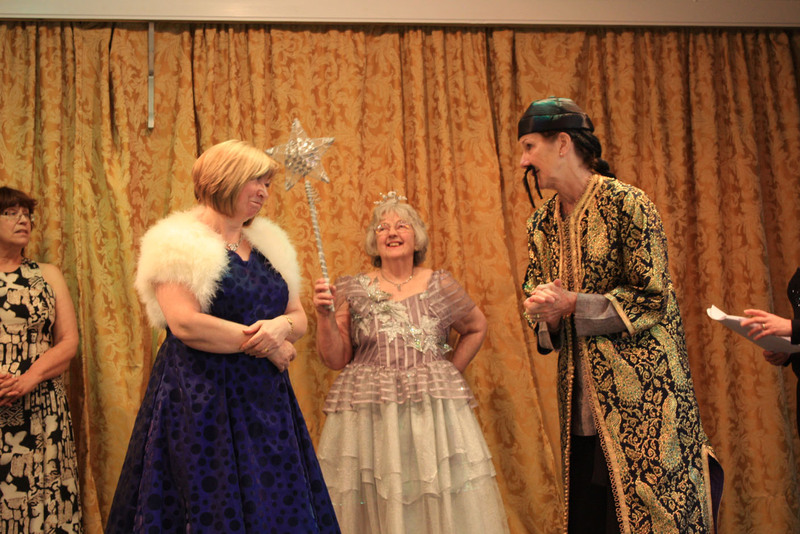 Other WI’s find it an interesting presentation as we demonstrate the dress whilst explaining the technical details of its construction and the challenges we faced (and overcome) as a group. Although we are still having requests for demonstrations, we will finally pack it away at the end of 2015 and finish on a high! Cindy Ella The (sort of) Musical – Singalong version! The last time we hosted the Beacon Group meeting, (this is a group of local WI’s who meet every year for a joint meeting), having listened to members fond memories of previous entertainments, we decided to do our own musical rendition of Cinderella. Having written the script, put new words to the music and started rehearsals we discovered one sad fact: no amount of enthusiasm could hide the fact that we could not sing! Well a few members could hold a tune but not enough to be a choir. Undaunted, we persevered and conscripted the help of St Stephens organist to help us find a ‘voice’. 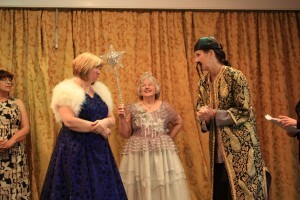 We adapted our pantomime to a ‘Sing-along, almost a musical’ and Cindy Ella – the story of an everyday WI member was born. Watch our video – Enjoy an excerpt from the “Finale” of Cindy Ella. The song was titled Aspull & Haigh, sung (very loosely, apologies to the village people) to the tune of YMCA with our own actions. “Once Every Preston Guild” is a well-known saying, because it only happens every 20 years! 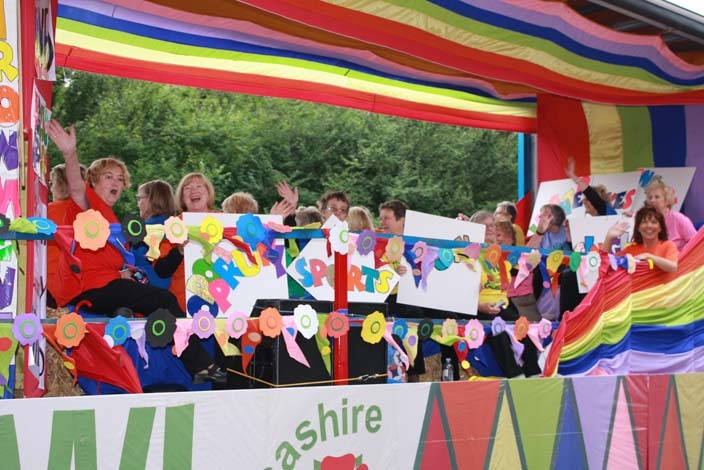 So when Lancashire Federation announced that they wanted to put a float in the procession Aspull and Haigh were quick to get involved. 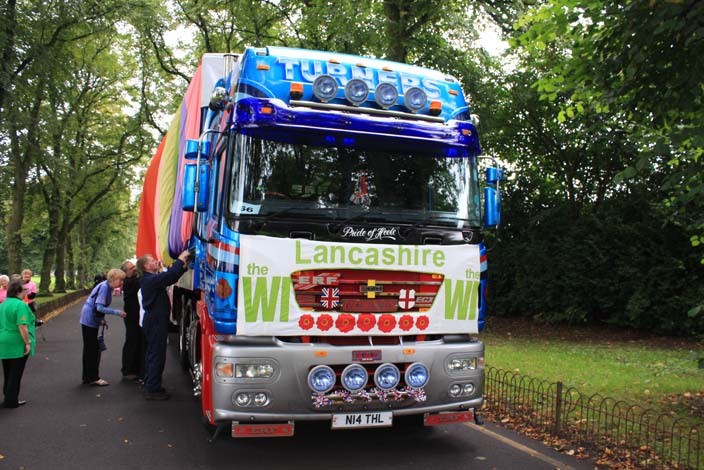 250 metres of fabric in 7 colours were torn into strips and machined into rainbow fabric at workshops and sewing sessions, with members from all over Lancashire, to dress the 12 metre long wagon. 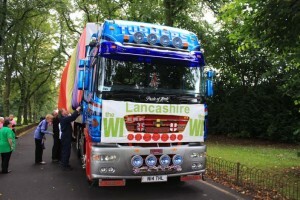 Add to that an applique large enough to cover the back of the trailer to make sure that we were well advertised. 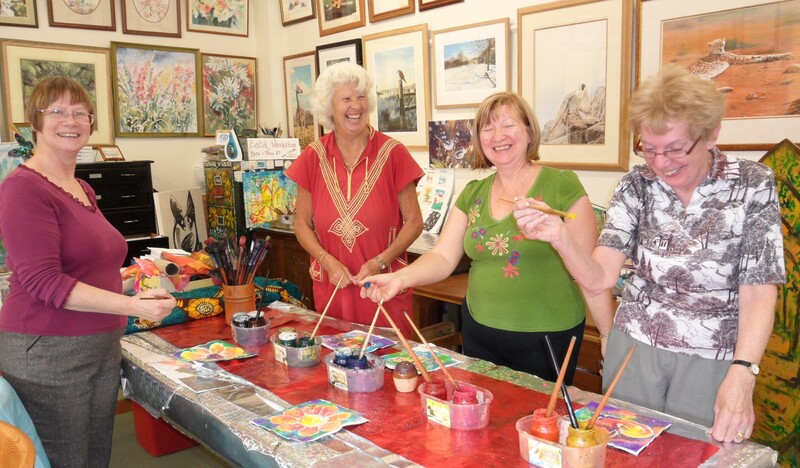 We were on “Radio Lancashire” at one of the workshops and our then President, Gill, was interviewed about the design and how it was put together. 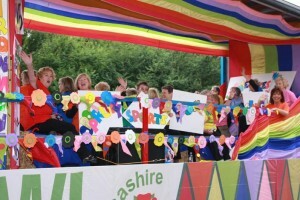 Having helped with all the preparations, our members were both on the float and walking behind with other Lancashire Federation members, who were wearing brightly coloured tops and umbrellas which were used in a routine (practised many times before the day) that would get “Strictly” jealous. 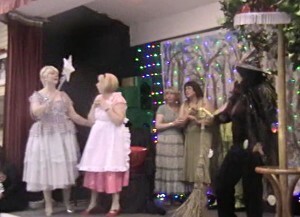 After our success with Cindy Ella at our Beacon Group Meeting, In 2015 when our turn came around again to host the meeting In 2015 when our turn came around again to host the meeting we foolishly said “Let’s do another Pantomime!” Thereafter followed over 6 months of determined effort (with a bit of fun thrown in) to produce a WI version of The Wizard of Oz called the WI Czar of Usz. 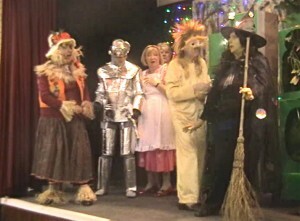 Dorothy has just moved to the area and meets the neighbours who. over cakes and wine, tell her all about the local WI, of which they are all members. After too much wine, Dorothy falls asleep and her dream becomes a trip to Usz where she meets the 3 ladies again transformed into Lion, Scarecrow and Tinman. This time we were joined by Members of Clayton le Woods WI Choir who combined with us during the performance to sing all the musical numbers. Watch an excerpt in the video above and we hope to have more videos available soon. If you would like to watch the full version (over 1 hour) the video is below. Enjoy! Literally, that’s what happened when our 2017 President, Gill Brown received an email from a producer at BBC Television. After a brief discussion, he explained that they were making a documentary about a local woman, Michelle Partington, from Hindley, who had been selected for the Invictus Game to be held in Toronto in September 2017. She was a front line combat paramedic and her story is quite inspirational, which is where Aspull & Haigh WI came in. 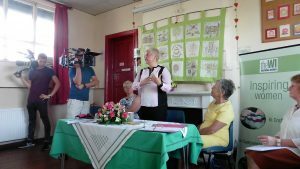 They wanted to film her giving a talk at a local WI meeting so could we oblige? 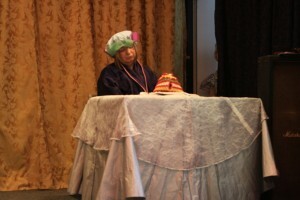 After hasty re-arrangements, we were able to organise a special meeting. 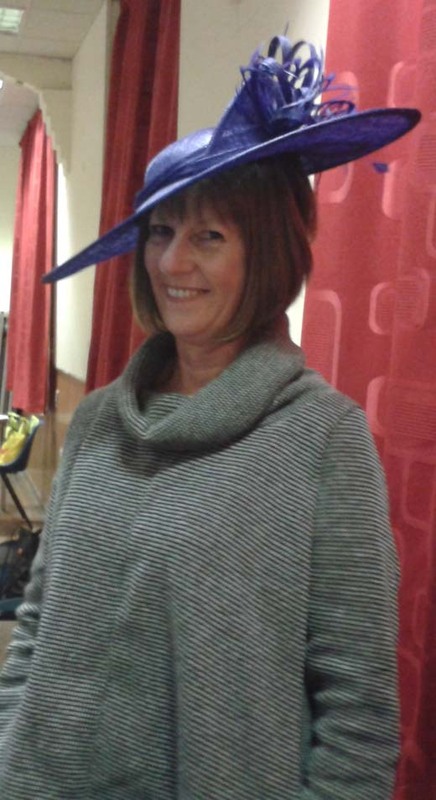 We invited all the local WI’s to attend, so on the night there were WI members from a wide area to hear her speak. We held it as a normal WI Meeting and the BBC film crew were there to capture it all. How much ends up on the cutting room floor we do not know yet! The documentary is scheduled for showing on Sunday 17th September 2017 at 17.35 on BBC1 and is called “Battle to the Start Line”. In this powerful and inspirational documentary narrated by Carmen Ejogo, the three former soldiers and combat medic reveal their darkest hours and moments of unexpected joy, whilst preparing to compete with 16 other nations on the sports field. Two members had their 40 year membership awards presented at the meeting where the BBC Film Crew were filming the above documentary. Thank you to the BBC for providing this film clip so we will always remember the night.